Ever since starting a business, I’ve always wanted a status board. I don’t really know why, but I just have. 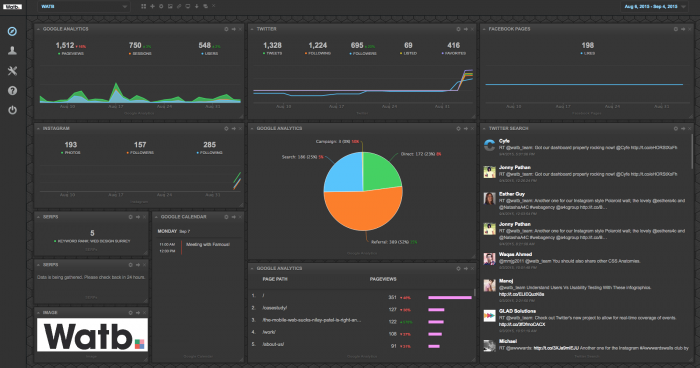 I remember telling an old colleague why it would be ridiculously cool to see all of our business metrics at a glance. He didn’t agree, he thought it was frivolous. Did he have a point? A business dashboard, or ‘KPI dashboard’ as they’re also known, is a way of showing all of your businesses key metrics in one place; you can visualise data from multiple platforms in one spot. One of the problems with using many different platforms on the web is knowing what’s going on across all of them. A problem I’m sure you’ll be aware of is having a stupid amount of tabs open during the day, yet these tabs are essential to keeping an eye on all of your business activity. This is one of the main reason as to why a dashboard could be a good idea. Another reason is targets. Having a dashboard on a TV (as I do at the moment) allows everyone in the office to see at a glance where we stand in real-time. Seeing visual proof of how we, and our clients are performing across the web can give us that additional push to try and achieve more. Having said that, a dashboard shouldn’t be used in a negative light. I would never implement one to make people feel bad about their performance; it’s there to allow analysis, reaction and be a helpful tool. Here’s the definition of frivolous – ‘not having any serious purpose or value.’ Let’s look at that. As mentioned above, you can probably see the value it could bring to your team. Not forgetting the time it saves you switching between multiple apps every five minutes. Does it have a serious purpose? It’s certainly not an essential tool to run a business or to view data on. Here’s the thing though, it could become essential to some businesses. 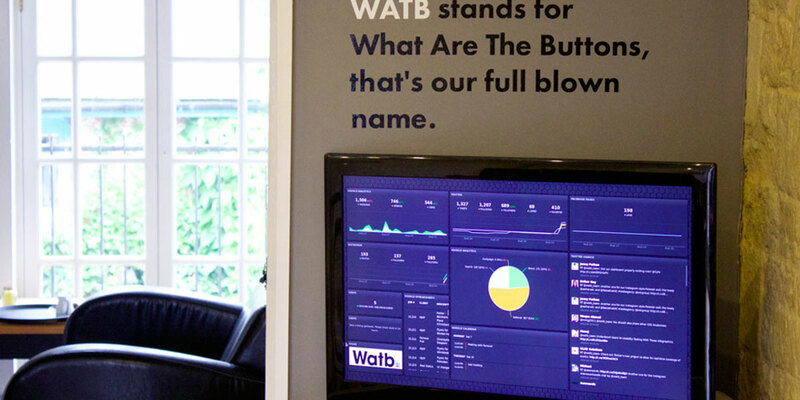 Let’s say you’re looking after a clients digital marketing, what if you shared the dashboard with them? Allowing them to see key data on their business and improvements you’re doing every day? Would that not add value to the service you are offering? Would that then be a serious purpose? Yes, it does mean you’d have nowhere to hide, but if you’re hiding, then you don’t deserve a dashboard. I’ve had one running for a week at WATB and here’s what we have so far. You’ll notice a few graphs, some text and other metrics. At the moment, we’re tracking social media activity (including mentions), SERPS, website analytics and meetings we have coming up. At a glance, I can see which pages on our site are performing the best, how we’re doing on Google, where our traffic is coming from, who’s talking to us, and what meetings we have lined up. I’ve only had a short time to see the impact at WATB, but I believe it’s had one. We have multiple client dashboards as well as our own and it’s really helpful to see what’s happening at a glance. Also, and this is true, a potential client came into our office, saw the screen and immediately got excited about it, further questions and discussion has led to new business. It’s already paying for itself. I can’t tell you how many dashboards I’ve tried out. All of the majors and minors have graced my screen, and with utter honesty, CYFE is by far the most suitable all rounder in my opinion. There are a plethora of integrations and cost-wise, you’re looking at $19 a month for the version free of limitations. There’s also a free version to try out which is limited to 5 integrations. When you compare what you get for your buck to other dashboards, it’s a no brainer – some of the other platforms out their will literally set you back the price of a small car. It may be slightly frivolous, but who said there’s anything wrong that?